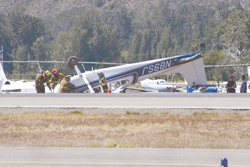 Rescue crews attend to a 1968 model 180H aircraft that flipped on the tarmac at Friedman Memorial Airport Sunday. The pilot, Michael Kraynick, is well. Photo by Roger Parker. Sun Valley leaders to discuss ?Gateway? Why are so many properties for sale?